The immortal Sid Meier once declared that “a good game consists of a series of interesting decisions”. (I’m not certain he’s entirely right with this, as it excludes all games revolving around dexterity or reaction speed, but then this site is not about Super Mario anyway.) If we try to apply this adage to CRPGs, there’s certainly a lot of truth to it: Character creation, combat tactics, dialogues, it’s all about decisions. So let’s focus on the important part: What makes such a decision interesting? Let’s start this at a point that both could be seen as an ancestor of computer adventures and features decisions at their purest nature – gamebooks, also commonly known as Choose Your Own Adventure-stories. With their strict limitations in terms of space and input method, they obviously can only offer a limited number of decision points with a limited number of options each, so it would likely be the best idea to concentrate the maximal thrill and drama on each of those precious few dilemmas, right? So what’s the most common type of decision we can find here? Alright, stop gaping. Now there may be circumstances where this choice might actually be thrilling, but overall, we can probably do better. What’s missing here? Uhm, why exactly should I even care? Note that if I had known only about the twig behind the left door, but nothing about the right (i.e. imperfect information), it would essentially have been left to my imagination to come up with possible consequences for going right. You know, there could also be a trap behind it. So, we have imperfect information and the possibility of very real consequences. But still, there’s something amiss. Really, would anybody choose the right door here? If the decision is so clear-cut, effectively it is none. Now, with these three elements – information, consequence, ambiguity – we can begin crafting interesting decisions. Note that they are not equal: In general, information and consequence lead to ambiguity. Wait, what was that? Ah yes. Circumstances. Decisions usually do not take place in a vacuum, so of course circumstances play an important part. But while we could introduce them as a fourth component, if you take a closer look, all they really do is make you evaluate the “consequences” factor. So we’ll throw them in there when we dissect the single elements. Perfect information on all alternatives: Ambiguity will have to come from consequences alone. Examples: Choice between two valuable quest rewards; the mage has to choose between three different monsters to fireball, with the same chance to damage each of them; the party may support either the current queen, who openly dislikes elves, or the rebel leader, who openly dislikes dwarves. Imperfect information on at least one alternative: It is not entirely clear what consequence follows. Examples: At least one of the quest rewards is an unidentified magic item (but it sure looks shiny! ); some of the targets are strange magical beasts and it’s not clear how they will react to fire; there is a rumor in the mage guild that the queen is not what she seems. No information on at least one alternative: Since the consequences for that alternative are unknown, they are instead replaced by imagined consequences. Give the player food for thought here to kickstart his imagination. 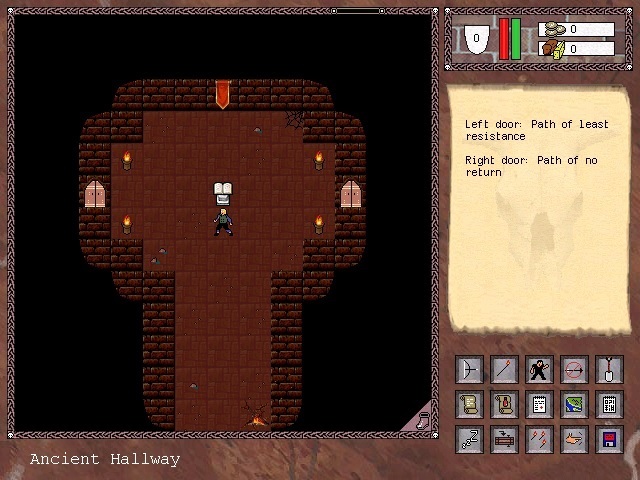 Examples: One of the quest rewards is a nondescript, rusty old key, but the questgiver was a long-time servant of the late archmage; one of the targets is a shadowy thing which seems to react randomly to spells; the party shall support either the queen or someone who the rebel leader says he will introduce at the appropriate time. Whether all of these informations are correct is another thing, but for simplicity’s sake let’s assume that at least your game mechanics always tell the truth. Certainty of consequence: The consequence is known, but it is not clear how likely it will come to pass. Examples: The rogue has a certain chance to pick the lock; the king flips a coin to see whether the burglar shall be hanged or let free; the assassin has a 50% chance to slay the king beforehand; the prince has a 95% chance to immediately claim the throne in that case, but a 0% chance to pardon the rogue (he told the assassin 100%, but, well, that was a lie – a privilege of storyline information). Delay of consequence: The consequence can take place either immediately or some time in the future. This is where things get wild, and even wilder if one alternative happens now and the other in an indeterminable distant time (maybe long after the game plot ends). Imperfect information plays into this, as usually no one can predict what will happen between the time points the decision is made and the consequence occurs… unless your game is extremely linear. However, everyone will try to predict things, so again imagination is hard at work again. “If you do this now, then somewhen, somewhere, I’ll be out to get you.” The most prevalent instance for delayed game mechanics consequences is the question whether you have to plan for one battle at a time, or conserve your resources for whatever comes next as well, since regeneration is not easy to come by. Circumstances: Of course, many questions for a decision must be answered with “maybe”, until you know enough about the circumstances. In general, the more sets of circumstances you have, the more interesting the decisions, as the same question may yield different answers each time it is asked. Be aware, though, that there is such a thing like too much information, and in general, there are enough variables and moving elements in a CRPG that in terms of game mechanics, sufficiently complex circumstances can usually be assumed given. It’s more tricky with storyline circumstances and consequences: While it is pretty easy to create new situations for game mechanic decisions once you have a solid system in place, every storyline decision that is meant to count for something needs a parallel version of the respective part of the game world implemented – without adding to gameplay length. If we have any kind of complex decision tree, where certain choices at some decision points open up additional options at other decision points, things get extremely complex quickly. So while highly reactive storylines and game worlds like in the Mass Effect trilogy are rather fascinating if done right, they are also extremely resource-consuming. Be careful. As said, ambiguity is the sum of information and consequence, with the consideration that delayed consequences by nature frequently lead to “more complex” ambiguity, so to speak, and by extension to more interesting decisions. The player is demanded to consider, imagine and play out the future, from conserving resources from a battle that might happen after this one, to investing in a skill that might be useful, to sparing a traitor that hopefully is now reformed to good. These are decisions that players spend minutes thinking about. However, as all of this is going on nowhere else but in the player’s imagination, if the player has no reason to believe that his storyline decisions will come back to haunt him later, or that the nondescript survival skill will actually impact the game, the respective decisions will become that much less interesting. Even worse, if he makes these decisions trusting that the game supports the eventual outcomings but gets disappointed (the survival skill is never used; nothing changes in the land no matter whether the queen or the rebel leader is sitting on the throne), it will be pretty frustrating. Now I don’t think it’s necessary to support each and every detail the player might think of, but some of them have to be. This requirement is actually more strict on game mechanics than on storyline decisions. If we put in a game mechanic, skill, spell, whatever, that requires a certain investment to use, it should definitely be useful somewhere. Otherwise, the whole principle of resource allocation, which carries many CRPGs, is suddenly placed on unsafe ground, if not quicksand. Essentially, by including a game mechanic, you are making a promise to your players; by not using it adequately, you are breaking that promise. With storyline decisions, you have a little more leeway. Of course it’s impossible to include all imaginable outcomings of a certain situation. But every once in a while, the players should notice that their actions make a difference, sooner or later; and that there’s a risk that it may actually a bad difference. That should keep them on their toes… and lend value to their choices. Note that I don’t mean to say that decisions with immediate impact can’t be interesting or even emotionally investing. However, as a tendency, that impact has to be harder than in case of a decision with delayed consequence; something like “Sacrifice one of your party members NOW!” – mmmh, admittedly that one may be a bit extreme. But everything that happens directly after the decision is usually gone out of the mind a few moments later. That’s about it. A lot of text about something which basically comes down to probability vs. probability. There are just two motivational factors which I’ve found to be quite influential when it comes to making decisions. One is greed, more related to game mechanics. Just know that enough loot tends to overwhelm the player’s reason, no matter how unlikely it is to actually be obtained or how much another set of magic armor and 100,000 gold coins are really needed. It’s human, I think. The other is hope, more related to storyline decisions. Things like “That traitor we let go free… this wouldn’t lead to a massacre in the palace, would it? A game can’t be that mean, right?” Ladies and gentlemen, let me introduce you to the Game of Thrones. Or The Witcher, as the case may be. Just make sure that in your game, the player’s decisions can make a difference. Occasionally to the good side as well. I’m quite certain that I have missed a number of points on this topic. Opinions and suggestions welcome. Nevertheless, I hope it has shed some light on a fundamental matter and will act as a solid foundation for further design entries. Addendum: There is an annual gamebook competition held at Arborell called the Windhammer Prize. The entries are limited to 100 sections each and thus can be digested quickly. Because of this extreme limit, the authors do their best to indeed make the decisions as interesting as possible. The best entries do not only feature original scenarios, but also show that gamebook design technology has come a long way since the days of “left or right?” – resource allocation, storyline dilemmas, skill choices and other tools are used to their best. If you want to explore the creation of decisions from the ground up, you should take a look!